By shibleyrahman in Dementia on November 11, 2014 . There’s no question that there is a greater number of people who are old needing to be looked after by care and support services in England. But dementia is not simply a disease of older people, one of the critical messages of “Dementia Friends”. Indeed, much of the budget goes into the health and care of younger people, as health technologies, say for treating cardiovascular disease through stents, get better. The reality is there is pressure on service and the workforce simultaneously in dementia, as the Nuffield Trust and Health Foundation have argued in a sophisticated way. Earlier in this year, in an article for ETHOS Journal “Living well = greater wellbeing”, I argued a joined up approach would now be needed to deliver a better standard of care and support for people living well with dementia. In 2010, the UK government became among the first countries to officially monitor people’s psychological and environmental wellbeing. Academic research and policy developments have recently converged upon the notion of ‘living well with dementia’, which transcends any political ideology. This means promoting the quality of life of any person with dementia. It views each person as a unique individual and champions his or her involvement in making decisions whenever possible. England actually leads the way with the ground-breaking ‘first mover’ exploration by academic Tom Kitwood of ‘personhood’ in the late 1980s: “It is a standing or status that is bestowed upon one human being, by others, in the context of relationship and social being. It implies recognition, respect and trust”. It’s estimated that there are at least 800,000 people currently living with dementia in the UK. These individuals are likely to come into contact with a number of different people and services in an extensive network including carers (paid and unpaid, including family caregivers), care home staff, transport services, social housing, welfare and benefits and the police to name but a few. I am, indeed, grateful for Paul Burstow MP’s excellent reply to my article. The current Government in England has made substantial progress with policy in dementia in my opinion. 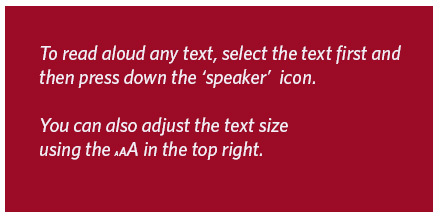 The current Care Act (2014) could not be clearer. 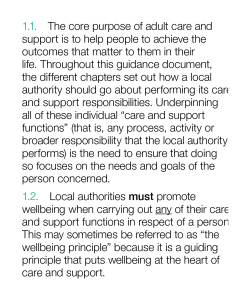 In the statutory guidance, the importance of wellbeing is signalled extremely strongly. It is important for commissioners not to lose sight of this, and not to treat ‘living well with dementia’ not as a slogan but as a reality. Helping people to live well has been a key aim of the current Government, and I hope future governments, perhaps implementing ‘whole person care’, will retain this strong focus. Enabling people to live well leads to a fairer society. The value of people living with dementia for society cannot be denied either. But people in power and influence have a rôle to play. The Alzheimer’s Society has played its part in addressing stigma and discrimination through its successful ‘Dementia Friends’ campaign. I myself am a “Dementia Friends Champion”, and proud to run my sessions. One of the key messages in this campaign is that ‘there is more to the person to the dementia’. This message is currently a critical global one, across many jurisdictions. 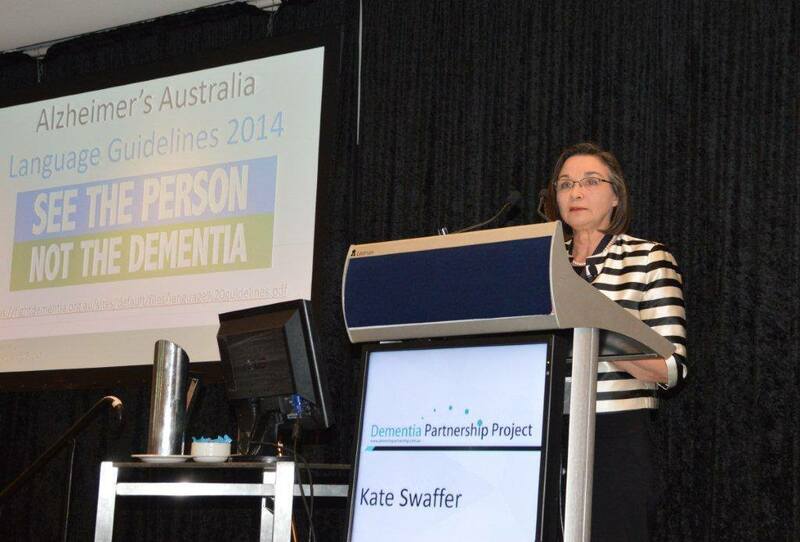 Here is friend and colleague Kate Swaffer with a huge banner in Australia to the same effect. And dementia and loneliness already occur together all too often. The wider community is essential. This is about compassion. It is also about the right people showing the right leadership. But this should not just simply include household names, although the distress caused by lack of inclusion of people with dementia in high street shops cannot be underestimated. This community must include all caregivers and professionals. And central to this recognition of the role of the wider community is a new deal for carers. As the number of people living with chronic conditions grows rapidly, so does the number of carers. There is a huge army in England currently consisting of selfless individuals giving of themselves to support a loved one. According to Carers UK, family carers currently save the Government £119 billion every year. Carers are invaluable as I discuss here. And we need to make sure in the next Government that all paid caregivers are given a statutory minimum wage, which could also be a living wage. We are a society which values footballers more than caregivers for people with dementia. This is simply abhorrent. I thank the current Government for progress made in this direction, but more has to be done whoever holds office and power next year. We need collectively to support the Dementia Action Alliance Carers Call to Action. By achieving the shared vision, the aim is to have positive impact on people with dementia and carers and improve their quality of life. But we do need some sort of standards, whether aspirational or regulatory, for example? In light of the recent Stafford Hospital Scandal, an independent review was carried out, underlining irregularities in staff training. According to today’s BBC report, as of March 2015, UK care staff and assistants in care homes, hospitals, and private homes are to be required to complete a training certificate within 12 weeks of starting a new position. I expect the next Government will wish to think about a register for paid carers to help the fight against neglectful care which can tragically happen. It can be hard to achieve a successful prosecution of ‘wilful neglect’, but likewise carers need to be able to do their job with dignity and without fear. 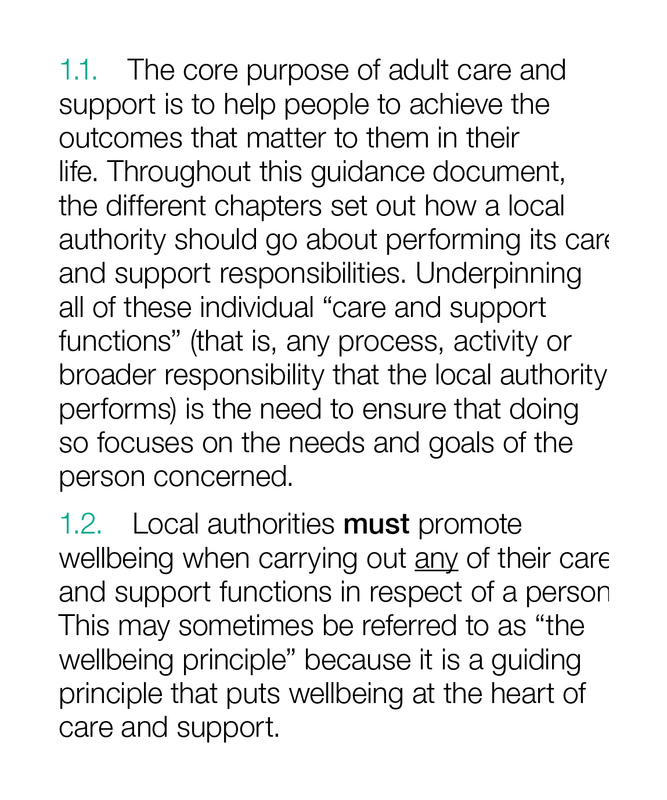 A historic pivotal document guiding dementia care in England is NICE CG42 (clinical guidance on dementia). the importance of relationships and interactions with others to the person with dementia, and their potential for promoting well-being. 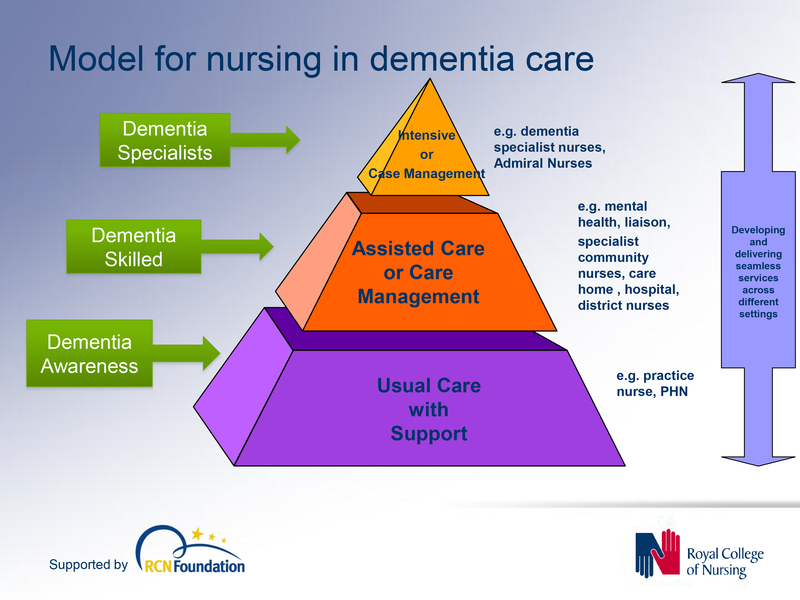 In a presentation called “Developing nursing in dementia care” in May 2014 influential expert Rachel Thompson outlined a “Commitment to the care of people with dementia in hospital settings”, calling for increase in specialist nurse roles –building evidence and supporting leaders. I believe strongly this need has not gone away. Indeed, it is stronger than ever. Staff who are skilled and have time to care. Assessment and early identification of dementia. Care plans which are person centred and individualised. I have previously described the overwhelming case for clinical nursing specialists in dementia on my blog here. 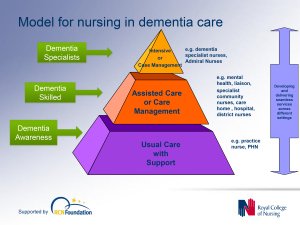 The financial case for ‘Admiral nurses’, an innovation from Dementia UK, is compelling; see for example the recent report from the University of Southampton Centre for Innovation and Leadership in the Health Sciences. As is the case from the academic and clinical nursing literature on the importance of proactive case management in avoiding admissions to hospital care. Headlines such as this one are obviously distressing. This one is from the Daily Mail in October 2014. Claims that nine in ten care homes and hospitals fail to provide the proper treatment are indeed astonishing. That particular Care Quality Commission review found widespread neglect, lack of care, poor training and failings in communication. In the same way there can be enormous disparity between a ‘bad’ and ‘good’ care home, there can be a subtle difference between a ‘very good’ and a ‘superb’ care home. We, one day, need to be able to celebrate the ‘outstanding’ in care homes: for example, person-centred activities or environment generally might make all the difference? The next Government, whoever it is, will need to have the confidence to implement an organic, stakeholder-driven systemic innovation in dementia. I have long felt that the health and care services need more than a minimum ‘protected funding’. As Roy Lilley, experienced health commentator, remarks, ‘more effort can be put into weighing the pig than actually fattening it’. This is the danger we run if we do not place adequate resources into service provision and training. However, even within these domains, I believe that innovation has, potentially, an important and responsible part to play (as indeed I argued in the Health Services Journal this year). There is no question that money is tight. But we need also to have a minimum in frontline services to maintain an adequate standard of care, as indeed is supposed to be enforced from the regulation of all clinical professions. It is easy to jump on a ‘person-centre care’ bandwagon, but all too easily this can turn into selling courses and products for person-centred care. Putting the person at the heart of how you behave with a person with dementia does not need to cost money. Tom Kitwood articulated it brilliantly. But, whatever the budget constraints of the health and care and future, I believe personhood should be pivotal for living well with dementia. This should include the whole person. If we involve people living with dementia in the design of research and services, I feel, a lot of my concerns will be addressed. The ‘Dementia Without Walls’ project from the Joseph Rowntree Foundation, in collaboration with other stakeholders, has truly been outstanding, for example. I am grateful to the current Government for taking us a long way down the journey. But we’ve only just begun. PCC may have been brilliantly and innovatively inspired by Tom Kitwood in the UK, but in reality, is not happening at very many care sites or care communitties around the world, including UK I am led to believe. Person centred care is still for the most part, a tick box that organisation suse, but still for the most part, do not provide. And on the topic of encironments or communities that are dementia friendly, no one can claim to be that (IMHO) until tha language CHANGES dramatically to one that is disrespectful and disempowering to one that people with dementia find respectful, as well as positive and empowering.